Average Height	: 32" - 35"
Average Weight	: 115 - 180 lbs. This is a very old breed with Roman records dating as far back as 391 AD. when Roman consul Aurelius wrote that "all Rome viewed with wonder" the seven  Irish Wolfhounds that had been sent to him as a gift. It is of no surprise as the Irish Wolfhound’s great size made him fearsome in battle and capable of pursuing the Irish elk, which stood six feet at the shoulder — double the Wolfhound's height — as well as the wolf, the predator from which the Wolfhound eventually took his name. 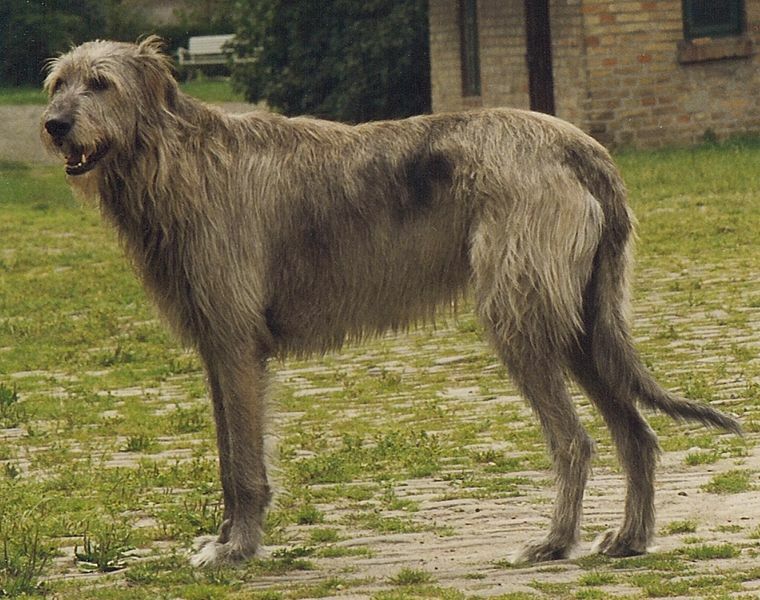 The Irish Wolfhound was always prized for their ferocity and bravery in battle where they were trained to pull the enemy down from their horses and/or out of their chariots. as well as to guard the herds and property and hunt elk, deer, boar and wolves. . There are many mentions of this great dog in Irish literature, dating back hundreds of years documenting that they were also known as a‘Cu’, a Gaelic word that probably meant hound, wolf dog, or war dog. Irish law permitted only kings and nobles to own the Irish Wolfhound, and the number of dogs owned was related to the prestige of the title held, i.e., members of the lesser nobility being limited to two Wolfhounds. Irish legends say that folk hero Finn MacCumhaill had upwards of 500 Irish Wolfhounds at one time. The Irish Wolfhound was a popular gift between Rulers and other important people. Often they arrived wearing chains and collars made with silver and gold. A favorite tale is that of the Irish Wolfhound sent to the Prince of Wales, Llewellyn, by England's King John in 1210. The hound was named Gelert, and Llewellyn loved him more than life itself. One day, Llewellyn went hunting and charged Gelert with guarding his baby son while he was gone. When he returned, he found the baby's crib overturned and Gelert covered in blood. Mad with grief, he slew Gelert, but as the faithful dog lay dying, Llewellyn heard the cry of his son. He searched further and found the child, alive, next to the body of a wolf that Gelert had killed. Llewellyn mourned his dog forever after and erected a tomb in Gelert's honor, which can still be seen in Caernarvon, Wales. Despite his fame, the Irish Wolfhound's numbers declined over the years, especially after the elk and the wolf in Ireland were hunted to extinction. From that point forward the remaining Irish Wolfhounds were kept by only a few families as ornamental dogs and rarely used to hunt from that period forward. The breed would have become extinct if they had not caught the interest of Major H. D. Richardson in the mid-1800’s. Richardson documented in a book he wrote that the Irish Wolfhound and the Highland Deerhound were the same breed. He began breeding Irish Wolfhounds growing it’s numbers in existence. Another advocate, a British Officer named Captain George Augustus Graham, used Glengarry Deerhounds, Borzois and a Tibetan Mastiffs to revitalize the Irish Wolfhound breed. He then crossed them with Great Danes resulting in the Irish Wolfhound of today. •	This Breed has a noble & commanding presence. •	Sweet and gentle disposition. •	Not recommended for Apartment/Condo living. •	Low activity needs, needs room to lay comfortable. •	Not great at negotiating stairs. •	Require 30-60 minutes of exercise/day. •	Will chase prey ~ need to be leashed, and not free to chase other smaller dogs in dog parks, cats in house unless properly socialized from puppyhood. •	Short life span: 6-8 years, and prone to several health issues. •	Not a good guard dog, although their size is a imposing. •	Not an outdoor dog, they prefer to live indoors. •	Not a great watchdog. Not a barker. Not aggressive. The temperament of the Irish Wolfhound is loving, patient, generous, thoughtful and extremely intelligent. If they were a human, they would be everyone's best friend. They are wonderful with children and a most loyal member of the family. If you are looking for a watchdog, the Irish Wolfhound is not the dog. His size is about the only thing that may scare strangers. He is far too loving and friendly to be a watchdog. They are easy to train due to their intelligence, loyalty and desire to please. He will respond well to a firm and loving hand. Make sure you are consistent in any training you give you Irish Wolfhound so he will always be self confident and well adjusted in the home. The get along well with everyone in the family and will get along with other small animals if they grew up together. If not, he may try to chase them while in the yard, although it's usually not a problem. They are a friendly dog that wants to make friends with everyone they meet. Their love and loyalty for their family is unconditional. It is because of these qualities that the Irish Wolfhound is so easy to train. Very few dogs have the completely all loving temperament that these dogs possess. The Irish Wolfhound is prone to cardiomyopathy, bone cancer. Bloat, PRA, von Willebrands and hip dysplasia. The Irish Wolfhound has a medium-length rough shaggy coat that will require brushing and combing to keep the shedding to a minimum. As with all dogs that are kept indoors and outdoors, you will want to make sure they are clean. Your Irish Wolfhound will love being outside romping around when the weather is nice and he will get dirty. Always be sure to check him for ticks or other insects when he comes back in. The Irish Wolfhound needs exercise and lots of room to run around. Because they are a large dog they will need more room to run and play, but they don't need any more exercise than a small dog would. They love going for walks with the family. When you are training them on a leash as a pup, do not let them get away with pulling, as this could become a problem when they are full grown and harder to handle. They cannot be left in the house all the time, but do not force them to get any more exercise than they feel they need as a puppy as this could affect their growth and development. Because they are such a big dog, many owners treat them as adults by the time they are 8 months old and this does them more harm then good. They are still puppies and puppies love exercise and will let you know when they want to run and play. Training for the Irish Wolfhound must begin when they are a puppy and before they are too large to handle. One of the first things they need to be taught is how to walk on a leash. It's extremely important that they not be allowed to pull. Remember, the size they will be as adults. If they pull as a puppy, they will continue to pull as an adult. Because of their loving affectionate nature, try to always use a loving and positive approach when training, as they will respond much better. When trainers say to use a firm hand, they don't mean harsh and physical, just firm so they know what is expected of them. He will be very quick to catch on to what you want of him. They need to be given plenty of self-confidence so they grow up to be proud and friendly dogs, not shy or aggressive. It's also important that your Irish Wolfhound be properly socialized around other people and children so he comes to know that they are friends and not something to fear. They do have minds of their won and need to be shown from you what is acceptable and what is not. As with exercise, there should not be too much training at one time when they are still growing so as to not over stress and damage their young bones, joints and ligaments. When you look at this big puppy, you will have a hard time remembering they are still a puppy, but they cannot be pushed too hard. Also, do not exercise for an hour before or for two hours after eating to avoid the Irish Wolfhound getting bloat, a condition that is quite common for the breed. If you plan to show your Irish Wolfhound in the ring, you will need to train him all his basic commands such as sit, stay, come, down, in addition to teaching him to walk on the lead in his correct position. When you start off with him still as a puppy, just do a little exercise at a time. They love doing things with you and love pleasing you, so try to make this into a pleasant experience. You may also want to consider taking him to a professional trainer. It is important that you participate along with the trainer so he knows he must respond to you as well as the trainer.